Q: Do you agree Untuckit shirts are the equivalent of the Sansabelt pants? The new shirt company seems to be spending an enormous amount on advertising this silly idea. A: We think you're giving Untuckit too much credit. 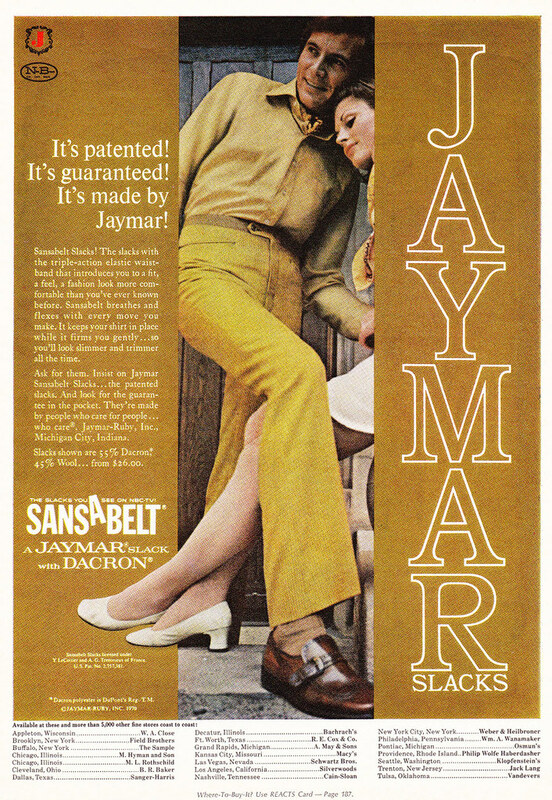 Sansabelt's innovation was to eliminate the need for a belt by elasticizing waistbands, thus disrupting dressing by automating pant tightening and putting an entire accessory category on the endangered species list. To match Sansabelt's achievement, a company would need to engineer a similar sartorial breakthrough, like combining socks with shoes or boxers with pants. All Untuckit did was circumcise sport shirts. That's not to dismiss Untuckit's value in the marketplace. Despite our long-standing admonishments against the practice, some guys cannot resist the urge to expose their hemlines. Any technology that spares them from looking like Obama throwing out a ceremonial first pitch qualifies as progress. The worst that could be said about George Washington is he's got an untreated case of Rosacea and teeth made out of a cherry tree. Obama, on the other hand, has no medical excuse for the toolbag backwards baseball cap. See From Cool to Tool: Tracking Barack Obama's Descent Into Toolbaggery. Vacationing on Martha's Vineyard, we get another look at Obama's casual wardrobe, and it has not improved much since the infamous first pitch. 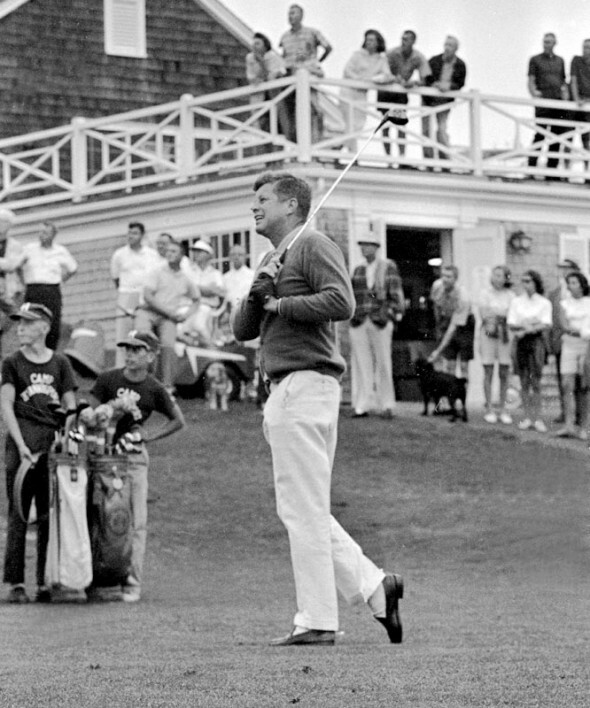 Left: JFK with classic American Optical Saratogas, in slim-fit pique polo with sleeves hitting at bicep. Right: Obama with Maui-Jimmyish Ray-Ban 3217s, in Hefty bag-fit Coolmax polo with sleeves hitting at elbow. Even though this photograph came out six days ago, we continue to get queries about it. Most want to know: Did Obama win Bono's sunglasses in a poker game at Davos? Answer: No. These are protective glasses he wore while touring The Chesapeake Machine Company in Baltimore, MD, January 29, 2010. Q: I was looking for a place to buy a pair of sunglasses like the ones that the character Tony D'Annunzio from Caddyshack wears to the pool. I saw you put them as an example in one of your answers but I can't seem to find where I could buy a pair, or something like them and I was wondering if you knew of a place? A: Was Tony D'Annunzio The Situation before The Situation? We cannot determine the exact make or model of D'Annunzio's sunglasses. (If you know, let us know.) The closest we think you're going to get -- and it's pretty close -- is vintage I Ski reflectors like the ones 44 is wearing (inset) before he turned into the most powerful toolbag on earth. These always turn up on eBay or vintage eyewear sites. A week after his girlish first pitch, it's Barack Obama's soccer dad jeans that are still in the news. Yesterday on the Today show Obama admitted to being "a little frumpy," and said, "I hate to shop." * "I hate to shop" is not something a president should be saying during a recession! * "I hate to shop" is such a lame refrain, as if by implicitly asserting his masculinity (because shopping is something guys don't like to do) that excuses his lousy style. * We've been covering Obama's lousy style for over a year. He wore the infamous All Star Game getup 9 months earlier at a White Sox playoff game on October 12, 2008 (pictured). After winning the election his toolbaggery accelerated at such an alarming rate we wrote an entire feature on the phenomenon: From Cool to Tool: Tracking Barack Obama's Descent Into Toolbaggery. Obama's most recent sartorial slip-up is just the latest in his crusade to win the crown of Least Stylish Black Man from Al Roker. Obama is clearly learning on the job. By next year he'll show up in flat-fronts. Yeah, we were a little harsh on Obama on his inauguration, tracking his 47-year fall From Cool to Tool. But there's Hope, and even Change we can Believe in. Forced to give up his Blackberry (which we've previously discussed), Obama has turned to the Sectéra Edge, which would be positioned quite nicely on the MB Portable Communication Guide. It certainly has the benefit of being both exclusive and obscure, and in spite of the QWERTY keyboard and touchscreen display, with only 2 hours of secure talk time and weighing a whopping 12oz. it also scores highly for senseless lack of utility. Now if he would just grow back the afro. Most men improve with age, becoming more magnificent and bastardly with each passing year. (At least until ED sets in.) Barack Obama is like Benjamin Button, a man whose MB-ness peaked in high school and has been on a downward slide since, hitting rock bottom with the backwards baseball cap. We've documented the new president's style history with a new feature: From Cool to Tool: Tracking Barack Obama's Descent Into Toolbaggery. Although the New York Times reports Obama is "clinging" to his BlackBerry and he says, "They're going to pry it out of my hands," it looks as though Barack Obama might have to give it up. Next thing on the agenda -- far more important than any stimulus package: find a decent casual wardrobe. On our extended break -- incidentally, we consumed enough Dewar's Rob Roys to kill the average bloke -- there were some very disturbing photos taken of the President-elect. (We had our suspicions back in July when he met the troops.) Sure, Barack Obama might soon be the 44th President of the United States, but the poor fella is a raging toolbag.